I started the day by climbing out on the roof to have a look-see. My primary aim was to take a look at all the various projections and holes through the roof, many of which are not connected to anything and could easily be removed and patched over, and also to check out the condition of the roof. Seems good, remarkably so considering that it is more than forty years old. There are some issues with the sealing between the roof and the wall, and going out there showed me the utterly craptastic job American Craftsman did on the painting, but it should hold for a while. While I was up there I took this photo, annotated for your pleasure. 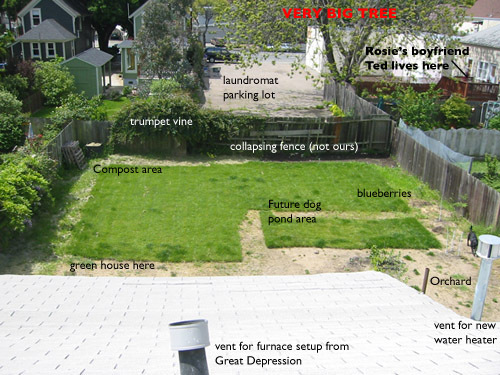 I had one comment and two e-mails last week asking about the overall garden plan, so I figured some overview of the landscaping as a whole was in order. 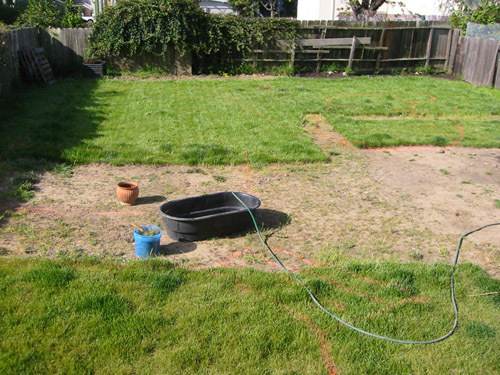 Here we see the garden as it is now, with grass covering most of it. I'm using the grass as a weed suppressant and soil cover, with the expectation that as we move along on the landscaping, most of it will come out. Here's a view from the ground, standing by the compost heap. The large black container to the right is the dog swimming pool, an agricultural watering trough. As you can see, I leave tools and stuff lying around the yard all the time. Drives Noel crazy. 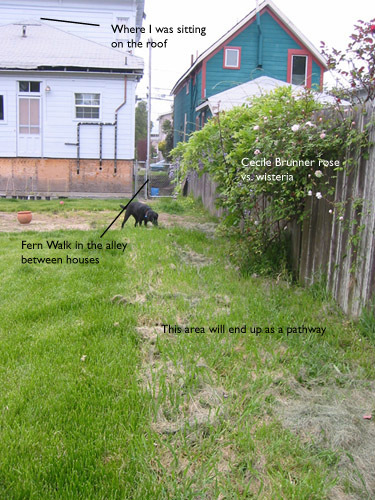 I turned a bit to show where the Fern Walk is, in the alley between the houses. The grass we spread on the side there has dried out and fallen between the vigourous weeds and volunteer grasses. Out in front, things are much simpler. A hedge of roses, a magnolia that is struggling to hold on, an arbour. And lots of weeds. 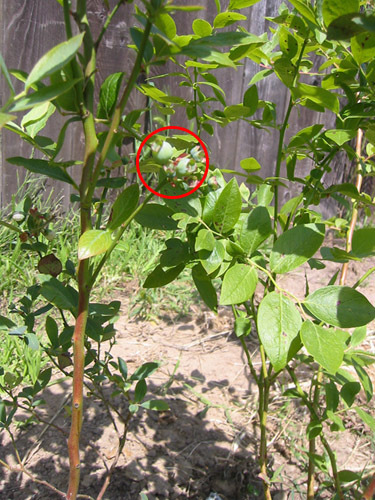 Our first blueberry forming on the bush. We don't have many flowers, and I don't expect much fruit this year, but wow: blueberry! 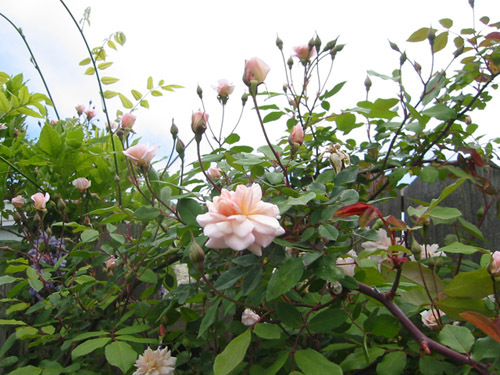 In the last week, the Cecile Brunner went from covered in buds to covered in blooms. This is its first really big bloom since I planted it years ago. Here are some of the flowers I've planted, all from Annie's Annuals, filling out and blooming, or getting ready to bloom. These guys are under and right next to the apple trees. 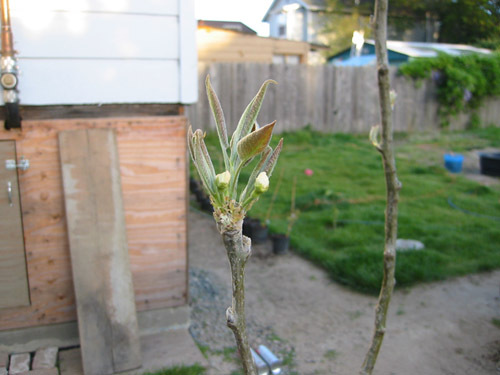 And by the way: the Asian Pears are blooming! I spent a bit of time today painting lines all over the yard, marking out where various hardscape items will be going. 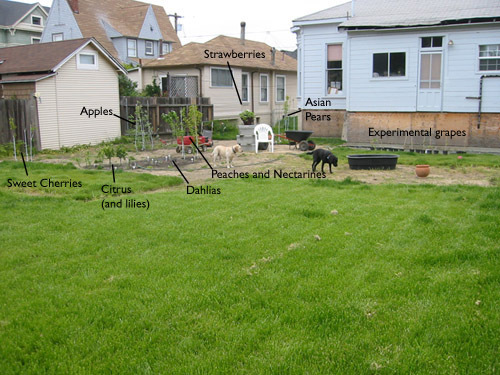 Here's a few lines that show the fence around the chicken yard and the location of a tree or shrub. From up at the back door, you can see the overall plan a little better. I was trying to figure out how many large shrubs and small trees I could reasonably plant back there, and the answer seems to be "more than I can think of right now." 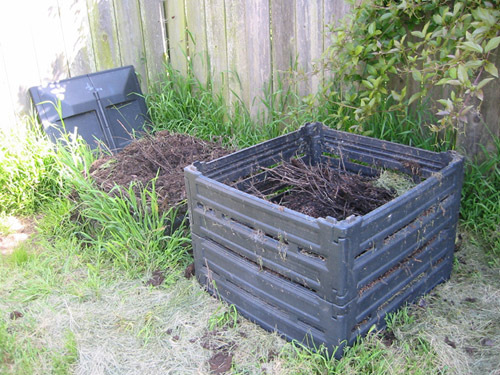 I'm a terribly lazy composter, and never turn or aerate my compost pile. I just toss things on top of it and let them rot, and once a year I flip it and get the good stuff out of the bottom. Today was the designated day for the annual turning of the compost pile. There was a remarkable six inches of good compost on the bottom of the pile, which made me happy. The lavender branches in there still need to break down some more. And a clay pot had ended up in there, I believe via the alpaca poop I added a few months ago. A bunch of Bermuda grass was growing through there, too, so I weeded that out. Much better now. The rest of my day was spent weeding. I subscribe to the "hold the ground you have" school of weeding, in which I weed the areas I just weeded first, so they stay weed-free. I only weed about a quarter of the garden now, because the rest of it either a) is too much to deal with right now, or b) is covered in grass and doesn't need to be weeded, thank goodness. 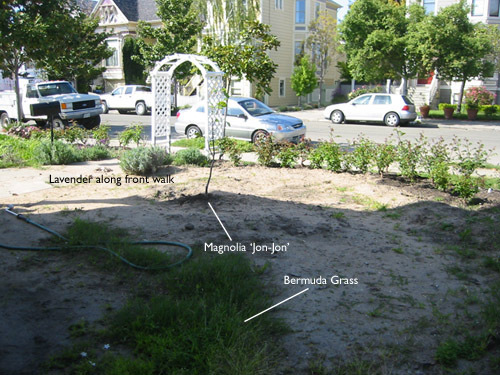 And mostly I weed the front beds, where the Bermuda took over and got a good hold during construction. Yuck. I never thought of going on the roof to get an arial view. That's cool. The yard looks amazing. Are you planning any thing in particular to hide the parking lot? Will the collapsing fence get replaced? Regarding weeding, I have a prevention first approach. Corn gluten meal is ok, and newspaper rocks. If you covered that area that will be a path with wetted newspaper 4-6 sheets thick and then mulched it (I tend to use our shredded paper and free coffee grounds), you will find the weeds have all vanished. Even more lovely is knowing they went to feed the worms. 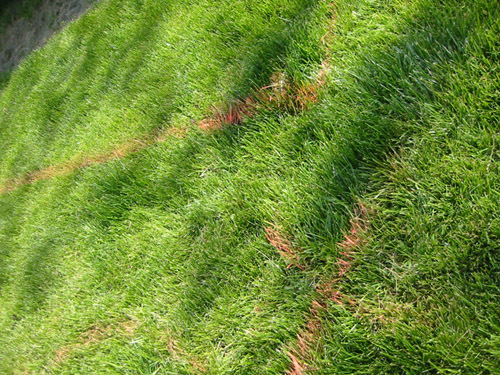 Sorry about the bermuda. I hate that grass with a passion and will use glyphosate on it when otherwise I stick to non-synthetic chemical stuff. Also, was that a tufted hairgrass from AA? 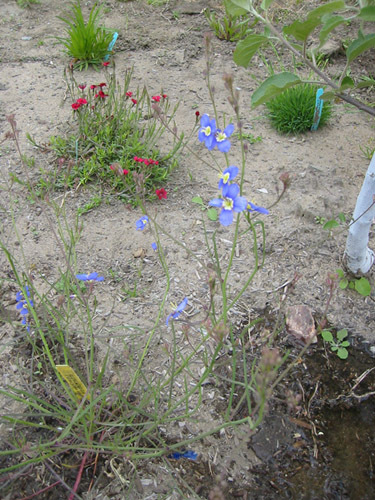 What's the little grassy plant in the back right of the photo with the flower? To hide the parking lot I am planning some taller shrubs and small trees. I want to be careful about making too much shade, since that is the South. I have a couple of small shrubs in pots now waiting to get large enough to go in the ground. Most of our weeds are, alas, Bermuda grass, and so far it has shown a remarkable ability to grow through any kind of mulching over I give it. There are five purchased plants in the photo. From the top left they are: Dianthus superbus, Verbena bonariensis, Dianthus arenarius (I think this is the plant you mean), Heliophila longifolia, and Dianthus deltoides 'Flashing Lights'. All from Annie's, as it happens. I haven't bought any grasses to plant yet, because I'm kind of overwhelmed by the existing grasses in the garden at the moment. Best wishes in your landscaping plans. It sounds as if you have put a lot of thought and planning into the project. How about using some 'curves' in your yard? Very pleasing to the eye. I notice in one photo that you have a garden hose...that is something handy to mark out a curved area or to see how it would look. Try it. I am sure you will like it!! You can see one drawing of my plan in this post. I've since refined some of it but the underlying structure is the same, because it is based on the shape of the house. I don't use hoses to lay out curves because I find they want to trace their own preferred geometry rather than the shapes I want from them. Instead I draw the curves out on the site plan then use some geometrical short-cuts to transfer that to the ground with string and stakes.